With its fascinating and unusual textures, this work shows Graun's consummate knowledge of both solo instruments, as well as his ability to orchestrate in such a way that they are not obscured. It is a valuable addition to the relatively scarce baroque and classical double concerto repertoire. Our practical edition primarily follows the source of the Sing-Akademie zu Berlin which was thought to have been lost, but was rediscovered just a few years ago. 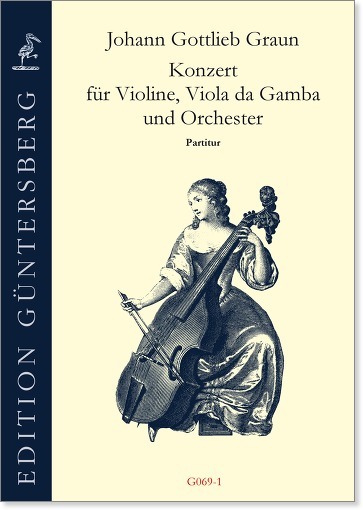 As a secondary source we used the copy from Darmstadt which is written by the gambist Ludwig Christian Hesse, but which lacks the part of the solo violin. We have also included the horn parts added by Carl Friedrich Zelter since they undoubtedly add to the string timbre. 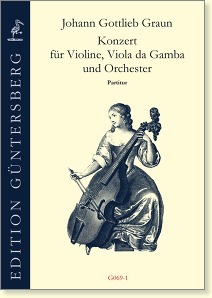 G069, page 38, bars 288 to 295, Violino concertante: [IS rests, SHOULD BE notes from bars 67 to 74]. Explanation: Q1 has rests in these bars, but this is obviously an error. G069, page 43, bar 436, Basso: [IS G, SHOULD BE A flat]. Explanation: Q1 has G, but this is probably an error as Q2 and Q3 have A flat.